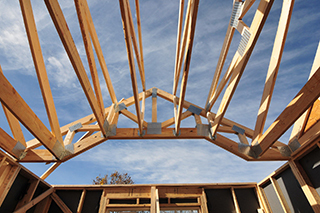 Roof trusses are highly engineered pieces of lumber connected by metal plates to form a web that supports a roof structure. Structures can be enclosed more quickly when trusses are used, saving time at the job site and possibly avoiding weather-related delays. Exterior walls and many roofs can be erected without the placement of interior bearing partitions, creating one large, open living space. This openness allows for entire ceilings and walls to be finished with drywall sheets, up to 1 feet in length, installed uncut. Rough and finish flooring can be laid over the entire area. Cutting and fitting around partitions is eliminated. The ability of trusses to have large, clear spans offers complete flexibility for the use of interior space, in line with the more progressive approach to building design. Partitions under clear spanning trusses can be moved without compromising the structural integrity of the building. Pre-engineered roof trusses construction eliminates guesswork, provides a more uniform roof appearance and speeds the construction process. Waste due to cutting errors in conventional framed roof construction is diminished. Pilferage on the job site lessens because engineered trusses generally can not easily be used on other projects. 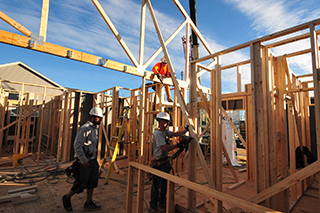 Less expensive carpentry labor can be used to install trusses, reducing labor costs. 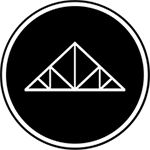 Trusses decrease the possibility of material shortage delays because roof framing is supplied in one material package. 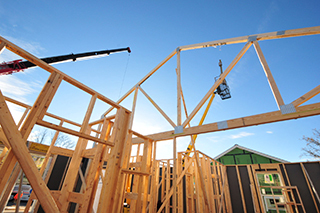 Trusses manufactured with dry lumber do not warp, twist, creating a framing system that is easy to properly place and sheath. By eliminating interior bearing walls, trusses also save the cost of interior foundation walls, interior partition top plates and headers. Truss Plate: Truss plates are manufactured with steel protected with zinc or zinc-aluminum alloy coatings or their stainless steel equivalent. They are designed to laterally transmit loads in wood and are manufactured to various sizes, thickness, and gauges. Wedge: Triangular piece of lumber that has one side equal to the standard 2 inch dimension lumber widths, and is inserted between the top and bottom chords, usually to allow the truss to cantilever. Its use is determined through engineering analysis. This video was published by the La Crosse Tribune. In it, a framing crew is installing long-span wood trusses on the main roof portion of an addition to the Menards store in La Crosse, Wisconsin. What is noteworthy is the way the crew is using scissor lifts to provide stable platforms from which installers can work to install bracing.